Chevron's traveling STEM zone made a stop at the Oakland A's stadium this fall for a co-sponsored event with the Exploratorium and the Oakland Athletics. John Murray Productions, Inc. worked with Corporate Media Events and Chevron to, once again, bring the hands on exhibits to life but this time with a baseball twist. The STEM zone, designed to excite young A's fans about the science of baseball, emphasized the science, technology, engineering and math of the game with exhibits such as Studio C where visitors learn the fundamentals of sports broadcast technology, and the baseball dissection zone where visitors could see how the physical components of the ball make it behave. 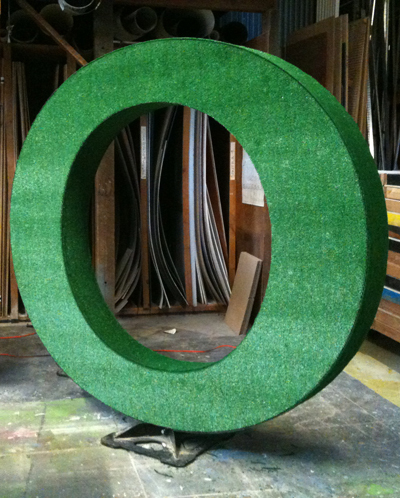 The STEM zone was installed in the East side club and the accompanying terrace, where a miniature turf baseball field was laid out. Fans at the game were invited to visit the stations placed on all four bases which highlighted concepts such as gravity, energy transference, fluid dynamics and reaction time. Large format graphics were used throughout the club to brand the space, as well as hand illustrated chalkboards and signage to complete the urban classroom feel consistent with the STEM zone look. 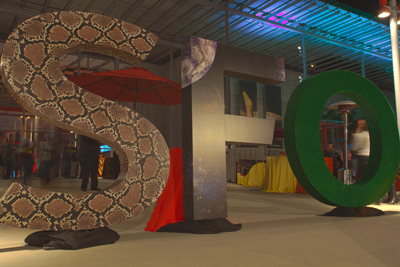 The event was a hit with over 2,000 visitors, and we were glad to work with the Exploratorium and be a part of our impressive home team's sponsored event. 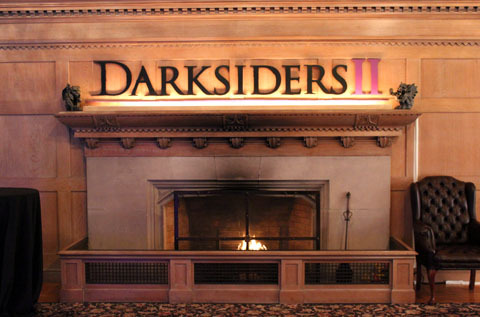 John Murray Productions, Inc. worked with event producers Cake Group to transform the space at San Francisco's Regency Center into a sanctuary of death for the press release of THQ's latest game, Darksiders II. The game features Death, one of the four horsemen of the apocalypse, seeking to avenge his brother War who brought destruction to earth in Darksiders I. The goal was to create an even creepier feel to the Regency Center, an old Mason's building in Nob Hill, where press and video game gurus were invited to preview the game and celebrate afterwards with a party. 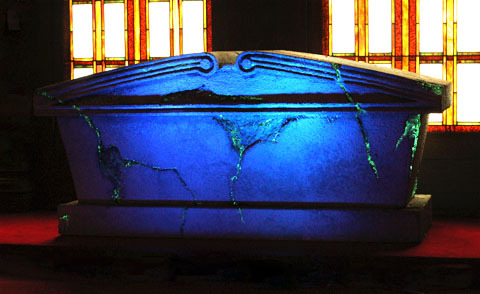 We achieved this by building four life size crypt replicas to sit in the window alcoves found in the Lodge room. 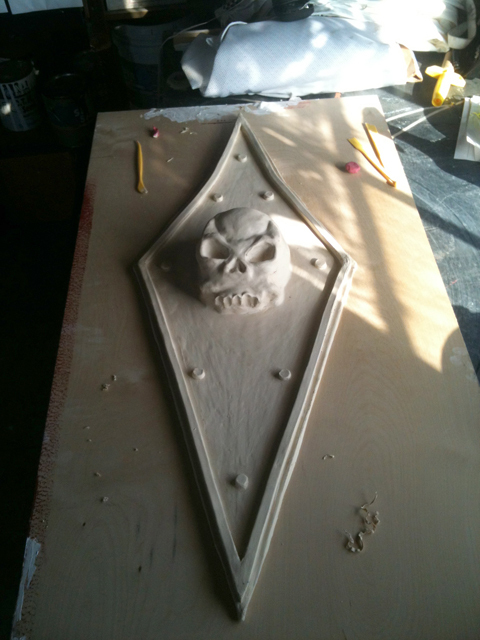 Additional custom details included skull and bone catacomb images cut into the wood detailed walls, and replications of the skull medallions found throughout the game, which were hand carved and painted to match the beautiful wood finishing. Large format images of underground crypts added to the creepy feel, and the use of gothic candelabras throughout the space completed the look. Game graphics were used to accent the Regency room, a branded space where guests were introduced to the look of the game with large format prints including an 8' x 14' graphic wall, three 4' x 8' graphic flats, and a dimensional logo adhered above the fireplace. The Candidate room was also utilized as the press interview room, with an 8' x 18' step and repeat for use as a backdrop. 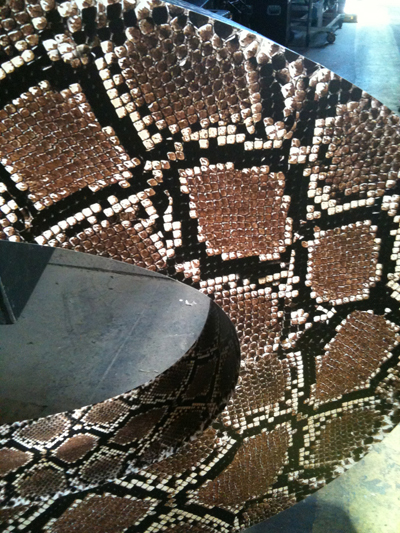 The client was extremely happy, and the event a great success! JMP worked with Jack Morton Worldwide in creating the look for the new Samsung Galaxy product launch and training event to be held in several cities across the United States. 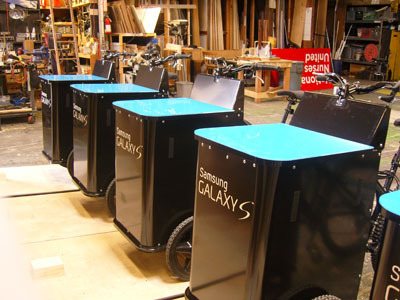 In efforts to emphasize the smartphone's portability, we were asked to create ten custom 3 wheel bikes on which the trainers could ride around the showroom floor, with a laptop computer affixed to the front platform. 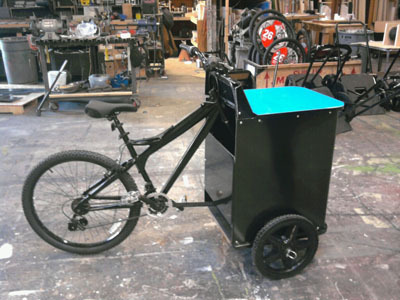 JMP fully customized the generic mountain bikes, with a front loading hinged platform and storage container featuring the company's branding. The client was very pleased, and we had a lot of fun in the process! 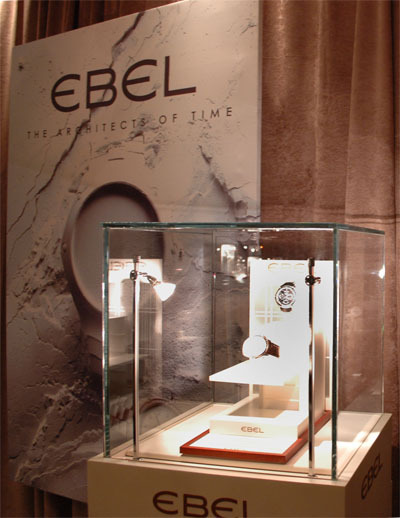 JCK Las Vegas, the jewelry industry's premier trade event, took place this June at the Sands Expo and Convention Center. 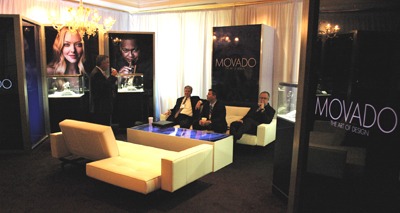 JMP came back for the second year in a row to transform several suites at the Venetian hotel into mini showrooms for Movado, Ebel and Concord. The transformation began with drapery covering the interior walls. 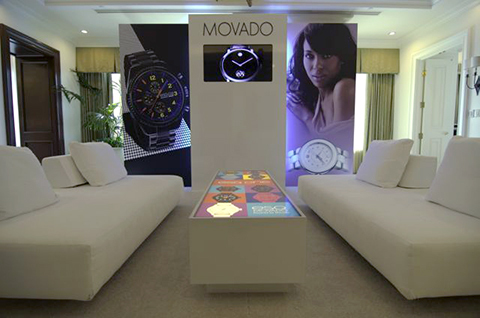 Flat walls provided the structure for the posh sets which included the clients' branding, and up-lit shadow boxes to highlight their latest products. High quality printing of the company's ad campaign on canvas flats really reinforced the brand imaging in the customized suites. The Annual Academy of Friends Oscar night gala was held this year at Ft. Mason, with the theme "Behind the Seams." 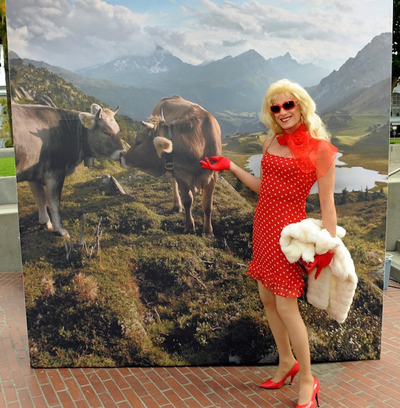 John Murray Productions, Inc. provides production support and donates soft goods for the Bay Areas largest aids fund raiser. We also created an oversized zipper for the VIP lounge. The event is the largest Oscar party outside of Los Angeles with proceeds going to AIDS research, and John Murray Productions, Inc. is proud to be a part of this annual event since 1996. For Giorgio Armani's exclusive VIP event, John Murray Productions, Inc. was hired to create an elegant runway and dining room inside the Nieman Marcus in Bellevue, WA which was used to showcase the label's latest collection. We transformed the space by creating a 44' by 35' enclosure in the center of the high end retailer's showroom. VIPs were invited to dine after the show in a separate space created using custom built soji screens. The label's branding was presented on black plexiglass and featured on the runway and in the dining area, further emphasizing the sophistication and classic appeal of the Giorgio Armani label. John Murray Productions, Inc. was pleased to be a part of TED's Mission Blue Voyage that took place this April. A collaboration between Sylvia Earle and TED, the five day cruise of the Galapagos Islands featured 100 esteemed guests and twenty-five inspiring speakers whose participation helped draw public attention to the urgent need for ocean protection. John Murray Productions, Inc. worked with Thinc Design and McCune Audio Visual to create the video studio onboard the National Geographic Endeavor. Our mission was to record and podcast approximately 30 episodes for the TED podcasts. The set was shoehorned into the ships lobby, the 7' ceiling caused considerable lighting challenges. The scenic elements consisted of up lit layers of translucent fabric printed with underwater images and hung floor to ceiling utilizing magnets to rig the fabric to the ships low ceiling. There were a few hurtles to producing these podcasts, not the least of which was getting all the studio gear onto the ship via Zodiak boats. For more on Mission Blue click here. COLAS, the world's largest international road construction company called upon John Murray Productions, Inc. (JMP) to coordinate staging and scenic elements for their semi-annual summit held at the San Francisco Marriott this past February. The purpose of the convention was to discuss new technology and safety in the road building industry world wide, and JMP was contracted to create the environment for this huge conference. The job involved creating numerous environments within the hotel, including a theater for 300 guests with raked seating, a giant rolling performance stage, and a custom made "floating" Golden Gate Bridge model that greeted guests on their way into the ballroom. The Marriott's enormous ballroom was transformed with 10,000 square feet of drapery, printed graphics and projected imagery. John Murray Production's talented fabricators also created a realistic ore cart that held raw asphalt for the elaborate display of materials used in modern road construction.